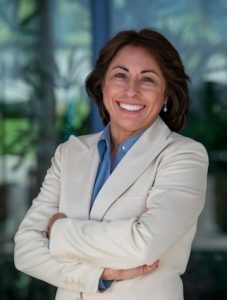 Mayor Vivian Romero is “truly excited” to be the newest member of the Metrolink Board of Directors, after being appointed Dec. 8 by Los Angeles County Metropolitan Transportation Authority (Metro) Chairman Mayor Eric Garcetti to serve as the alternate for L.A, county Supervisor Hilda Solis. Metrolink is a Southern California regional commuter rail service governed by The Southern California Regional Rail Authority (SCRRA), a joint powers authority made up of an 11-member board representing the transportation commissions of Los Angeles, Orange, Riverside, San Bernardino and Ventura counties. The transportation system included seven routes that run through 6 counties. It is the second largest commuter rail system in Southern California, (Metro is the largest), and third largest in the county, according Metrolink’s announcement of Romero’s appointment. Romero is the first LGBTQ elected official to serve as mayor of Montebello, a position appointed by a vote of the members of the City Council. She is the founder of a boutique entertainment group focusing on management, licensing, publishing and contract negotiation. Attending her first official meeting last week, Romero thanked Solis for facilitating the appointment and “her confidence and faith” in her. “Based on my experience as recent past President of the Independent Cities Association and the current Chair of Metro’s San Gabriel Valley Service Council, I am prepared to work collaboratively and contribute toward improving regional mobility in Southern California,” Romero said. December 15, 2017 Copyright © 2012 Eastern Group Publications, Inc.